Felling of a well chosen tree with good technique can be entirely straightforward. Ill thought-out felling can become complicated and dangerous. The article below is designed to help keep things safe and straightforward. Photo: Paul Kirtley. 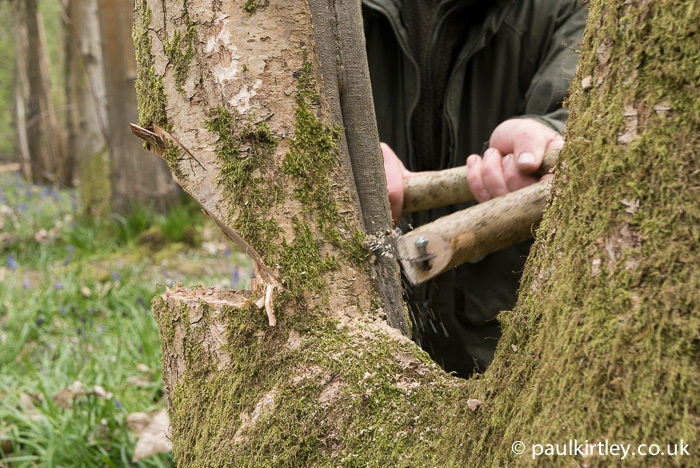 Proficient felling of a well chosen tree, using good technique, can seem effortlessly straightforward. On the other hand, ill thought-out felling can become complicated and dangerous. Either way it is one of the more hazardous endeavours in the woods. In this article I want to highlight the main pointers I teach to people when learning to fell trees. I will assume you have basic axe handling skills and good general axe safety awareness. 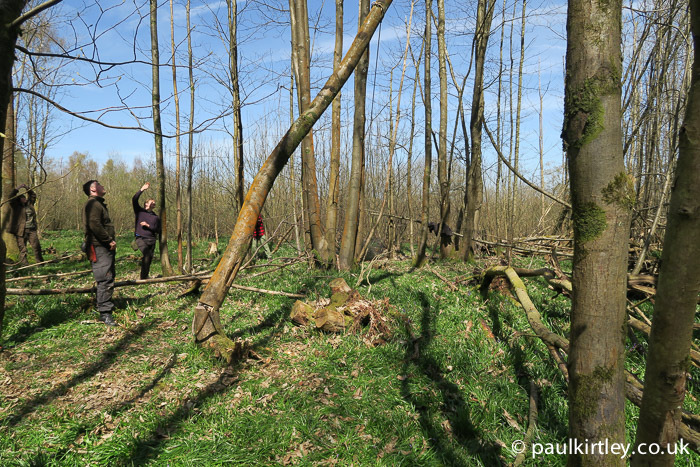 Why Might You Need To Fell Sizeable Trees? 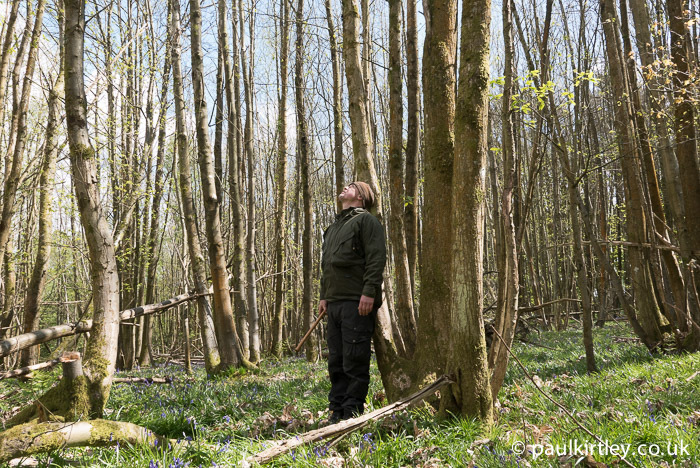 There are a number of good reasons why you may need to fell sizeable trees. 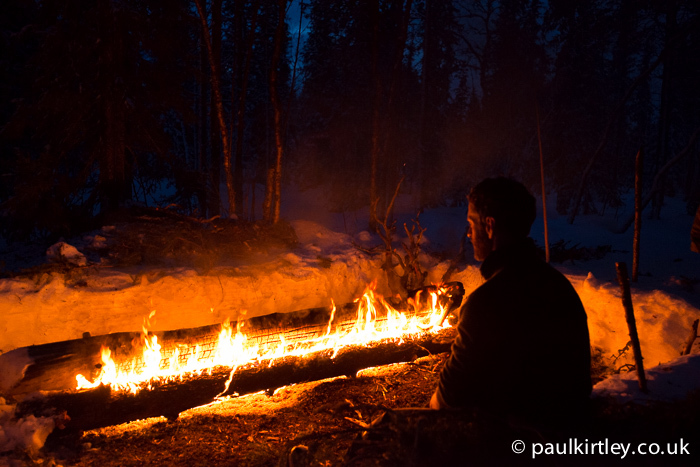 The need for firewood is a common one, particularly in winter conditions. 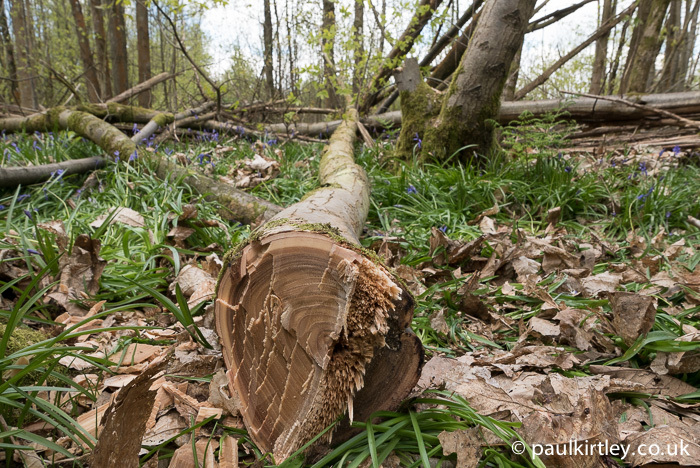 Dead, standing timber is the best source of dry firewood in the forest. If you are building a long-log fire, then you need logs of a good diameter. Even if you are using smaller fuel, it may be most efficient to source it from a dead-standing tree then split it down. A second reason you may need to take down a tree is to make a camping spot safe. I’ve had to do this a few times on canoe trips, where the camp site has been compromised by an unsafe tree. You might think, why didn’t you just move? Well these situations arose either on islands in rivers or in areas of thick bush where there was an established, albeit small, camping spot. Third, you may need materials for woodcraft projects. This could be the wood itself, the bark or both. Firewood of all sizes can be split down from rounds of larger felled timber. Photo: Paul Kirtley. Your primary tool for felling is an axe. 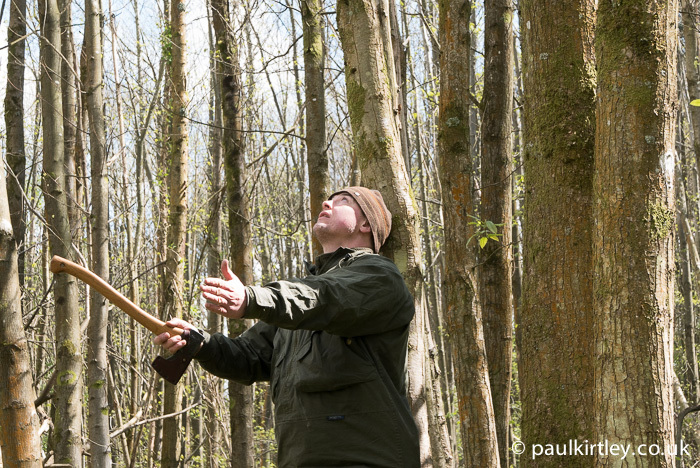 You can use a half-length axe and upwards for felling. Hatchets are too small and light. 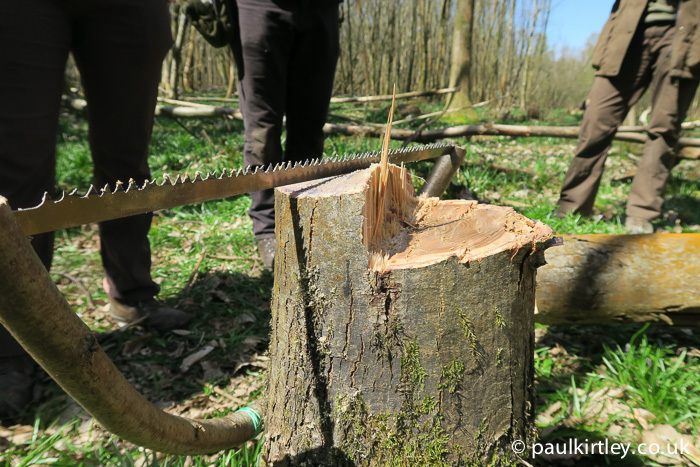 You can fell entirely with an axe but it is somewhat more controlled if you use a saw in combination with you axe to complete the felling. 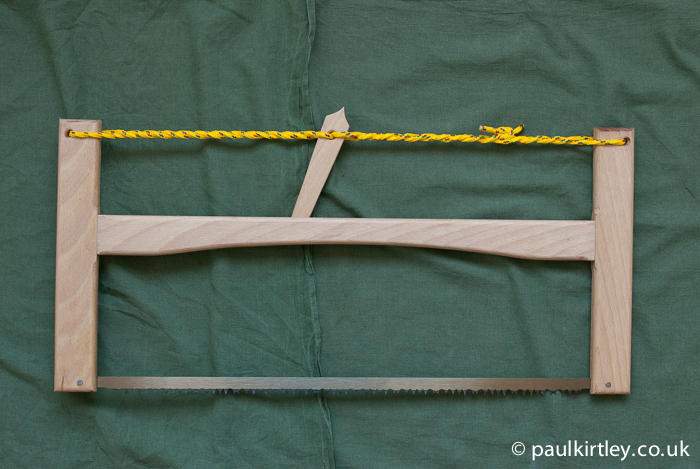 On trips I tend to carry a folding bucksaw, which breaks down and folds into a relatively compact shape. 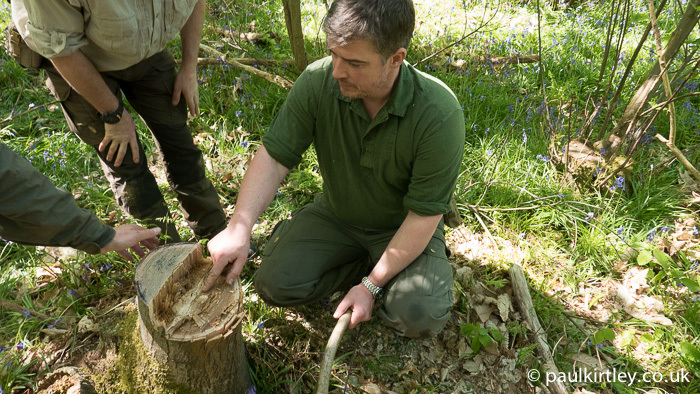 It is also possible to carry just a saw blade and make a saw with materials you find in the forest. In addition to your axe and saw, you should carry a sharpening stone with which you can maintain a keen edge on your axe. A sharp axe is an efficient axe. In remote settings, it’s also prudent to carry a metal file for reshaping the edge, should you chip it. 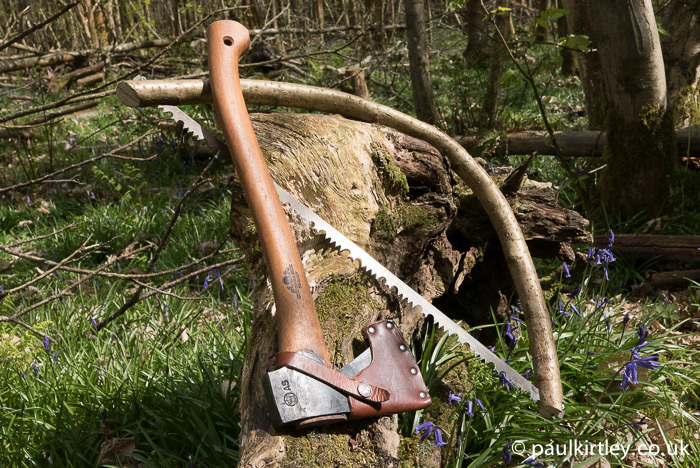 A folding bucksaw is a full-sized saw which is also easily packed. Photo: Paul Kirtley. A half-length axe and an improvised bow-saw. Photo: Paul Kirtley. I’ve already mentioned it’s sometimes necessary to take down a tree (or the remaining part of a tree) that is making a camping spot unsafe. Otherwise, you tend to have a choice of what you fell. My advice is to keep the felling job as simple as possible. Hung up trees are difficult to deal with, especially with limited equipment. When a tree first starts to fall, it has very little speed or momentum. It is easy for a relatively small branch touching from a nearby tree to stall the fall in its early stages. If you are choosing to take down a dead tree for firewood or a live tree for materials, make sure it is clear of other trees which could interfere with its fall. Also make sure the tree will fall into a clear area. If you are not well-practiced at dropping trees, then think twice about trying to achieve pin-point accuracy with where the tree has to fall for it to come down cleanly. Then, look at the lean of the tree. Is the tree leaning the way you want it to go? Or is it leaning in the opposite direction, or off to the side? Don’t just look up at the tree from a distance. Stand at the base of the tree and look up. Once you have a general idea of which direction the tree will want to fall, you can obtain an even better idea of precisely where the tree is going to fall, by standing with your back to the tree trunk, then looking up. A further factor to assess is whether there are more branches on one side of the tree than any other. This may help or hinder the tree in falling in the direction you want it to. A final factor which can help or hinder the tree’s fall is wind. If strong enough, wind can push a tree in the opposite direction to which it would otherwise go. Wind also moves trees around a fair amount and may increase the risk of the trunk splitting as you start to fell the tree. Get under the trees and look up. Photo: Paul Nicholls. 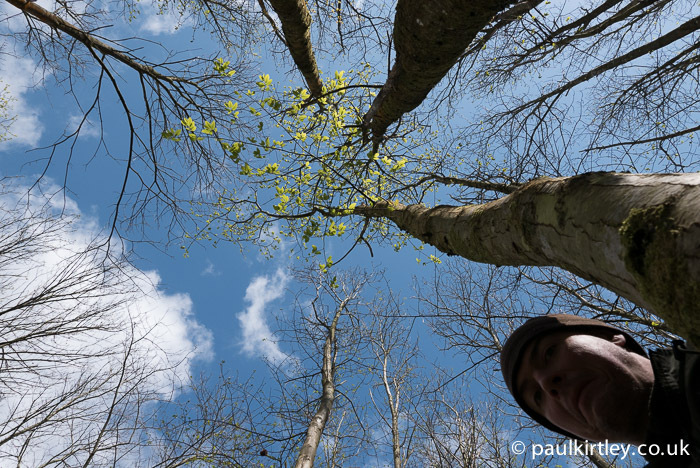 Look up to see which way the trees are leaning as well as which side has most branches. Making an assessment of which way the tree wants to fall. Photo: Paul Nicholls. First, it’s worth us stepping back for a moment to think about the structure of a tree trunk. It is a bundle of fibres, fixed to the ground at one end. Like any upright structure, the weight bears down through the structure. And like a stick, if you bend it, you put the fibres on the outside of the curve under tension and those on the inside of the curve under compression. We are going to use our understanding of the structure of the trunk to help our felling. We are first going to remove some of the wood from the trunk on the side we want the tree to fall towards. This action removes the support the tree has on one side and should create a small lean in the tree. This puts the outside fibres on the opposite side of the trunk under tension. We can then cut these fibres – almost one by one – until the tree begins to fall. First we make the front cut – sometimes called the gob cut – with the axe. 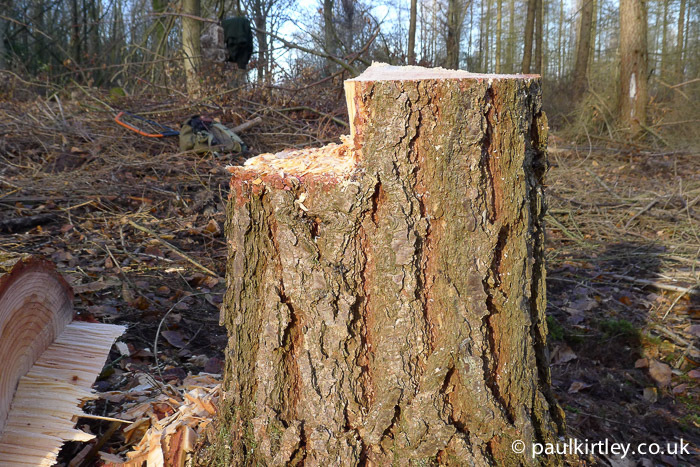 This is a wedge-shaped cut, the centre of which should be the direction we want the tree to fall. We cut back into the tree no further than halfway through the trunk. The base of the cut is horizontal and the top of the cut is angled, such that as the tree falls, the top will not touch the bottom until the tree trunk is most of the way towards the ground. The back of this cut, where the two angles come together is at right angles to the direction of fall. Inspecting a front cut. Photo: Paul Nicholls. 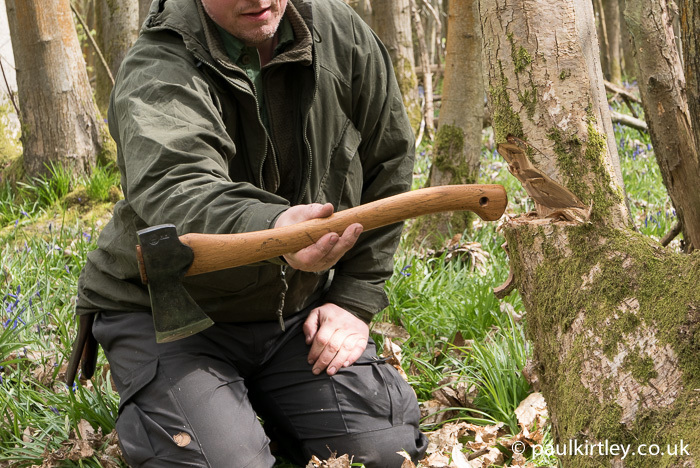 Highlighting the line on which the tree will fall, using the handle of my axe. Photo: Paul Nicholls. Once you have completed the front cut, you need to make a cut at the back. 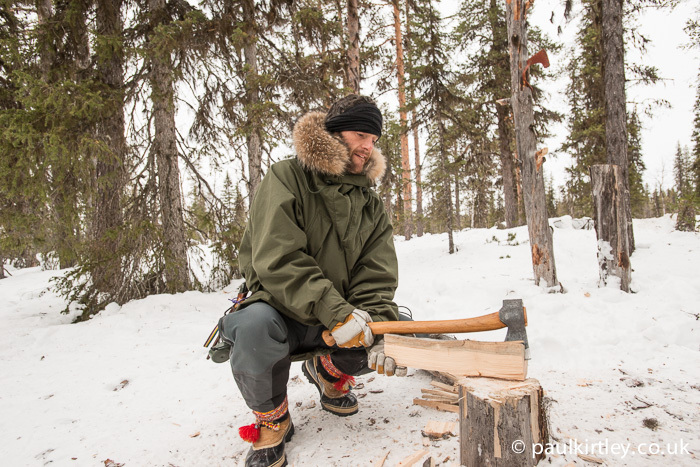 It is possible to make back cuts with an axe but it is less controlled than with a saw. A saw is a great tool for the job actually. Because the fibres at the back should now be under tension, there is little chance the saw blade is pinched. You can cut in gradually with the saw, in a very controlled manner. At this stage I should say you must not pass in front of the tree once you have begun the front cut. You are in the process of destabilising the tree. Nor should you walk too close to the back of the tree behind the direction the tree wants to fall. Therefore you should have both your axe and saw with you before you begin. The base of your front cut should be horizontal. Your back cut is also going to be horizontal. To achieve this you cut horizontally with your saw. Ensure the blade is running parallel to the back of the front cut so you are cutting symmetrically behind the front cut. The critical point – sometimes displayed incorrectly in books – is that the back cut must be made above the bottom face of the front cut. 2.5cm (1 inch) is a good distance to start above the line of the bottom of the front cut. This gives some margin for error if the saw dips down while cutting. Start cutting the back cut as horizontal as possible. Photo: Paul Nicholls. Keep the blade of the saw parallel to the back line of the front cut. Photo: Paul Nicholls. Why is the relationship between the position of the front cut and back cut so important? Well, it creates two mechanical features which make the fall of the tree more controlled and predictable. Putting the back cut above the bottom of the front cut creates a step. The back of this step forms a backstop for the base of the tree as it falls. This stops the trunk slipping backwards off the stump and provides a stable pivot point. The step created by making the back cut (right of photo) higher than the lower face of the front cut (left of photo). Tree caught mid fall in this photo. You can see the back cut opening up and the base of the trunk pivoting against the back of the step. 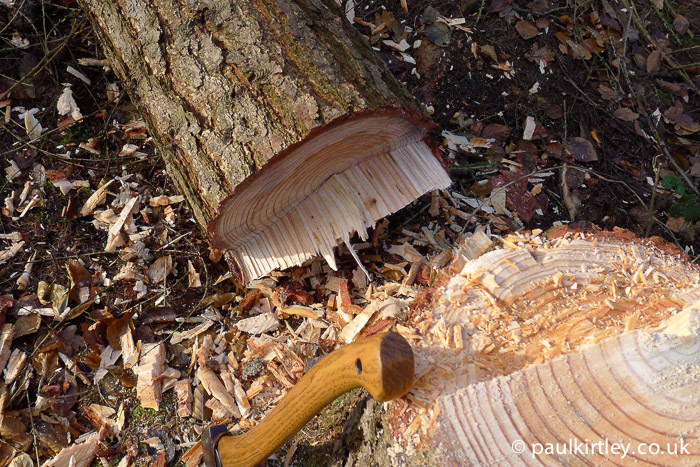 During the process of making your back cut, the tree will begin to fall. Usually, the saw blade wont reach the front cut before the tree starts to move towards the ground. 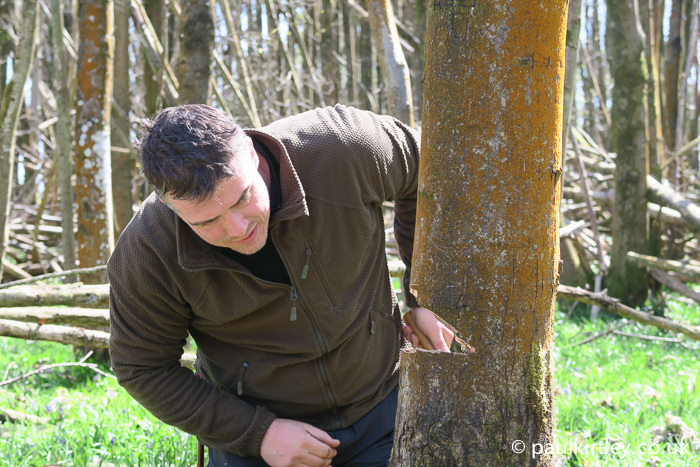 Once you have cut enough fibres at the back of the tree, it will be free to move away. So, you will usually end up with an area in between the front cut and the back cut where the fibres remain attached. These connected fibres we call a hinge. Only when the trunk pulls away from the stump will these fibres disconnect. The author pointing out the area between the front cut and back cut which formed the hinge. Photo: Amanda Quaine. The long fibres in the centre of the stump remain after being pulled out of the base of the trunk as it fell off the stump. Photo: Paul Kirtley. Looking at the base of a tree trunk after felling. The upper face of the front cut (left), the torn hinge fibres (centre) and the back cut (right) are evident. Photo: Paul Kirtley. Stumps of dead, standing pine trees felled for firewood on a winter camp. Photo: Paul Kirtley. The accompanying images of felled live and dead trees all show good examples of hinges, having worked in a good fashion, some of them textbook. There is, however, something that can go wrong, caused by a serious split in the tree trunk. Rather than pivoting from the step, with a nice hinge in place, the tree can split up the middle of the trunk, then pivot from a point higher up. The trunk still comes down to the ground but the section of trunk from the back cut up the pivot will be levered up and away from the tree at the back of the trunk. This is a major reason why you or your companions never stand or kneel behind the tree. Work from the side of the tree. This pivoting from higher up, with a section of the trunk being turned skywards, is called a barber’s chair. If the lower end catches you, it could be extremely injurious, if not lethal. First, after selecting your tree and assessing direction of fall, you should ensure you have a clear work space at the base of the tree. You don’t want to be tripping or rolling your ankle while using your axe or moving in the vicinity. Nor do you want the use of your axe or saw to be impeded by nearby vegetation or shoots from the base of the tree. Check there is nothing nearby that might catch your axe as you swing it. Once you have your work area cleared, determine your escape routes. You must be able to move away from the tree as it starts to fall. For obvious reasons, you do not want to move in the same direction as the tree will fall. For reasons explained above, moving directly behind the tree can also be hazardous. So, back and away at around 45 degrees is a general rule. Satisfy yourself you can move swiftly along your route without tripping or slipping. Remove anything which may impede your safe retreat. Determine your escape route before starting to fell. Photo: Paul Kirtley. Finally, if you have companions with you, be clear with them you are felling trees. Make sure you know where they are and if in the vicinity of where you are felling (e.g. watching) make sure they are at a safe distance away, off to the side or behind where there tree will fall. Even dead, dry trees are heavy. Live trees, with the water they contain, multiply the weight involved a number of times. The mass coming down to the ground, even in a modest tree, can b surprising. The leverage which a tall trunk can apply at its base is colossal. Always take great care to apply the safety considerations above. Remember to keep things simple and straighforward. Build experience gradually and don’t bite off more than you can chew. This is a fantastic description. Your blog inspires me all the time and frequently I can learn something new. Whilst looking up at the tree to assess how it might fall it is prudent to lookout for any widow makers, free branches that might be hung-up there. These may fall in a different direction to the tree you are felling or, more likely in my experience, be dislodged as you work. These can easily cause serious injury. Whist felling trees we wear hard-hats on the conservation work parties I’m involved with. You are unlikely to have one with you in the forest so best be wary. Of course on a canoe trip you might have a helmet I suppose but better safe than sorry and assess the hazard properly before you get started with cutting tools. Yes Steve, very good points. It is also wise to consider the species of tree to fell. Dead standing Birch for example are notorious to have top ends break off as you chop down the tree. Fantastic article as always Paul! I especially like your highlighting of branches and their effect on lean and falling direction, that’s something I figured out the hard when I dropped my first few boughs. Most trees i felled had been trees in forests in Germany, where I could not ask the owners on a hike, because I didn’t now them. 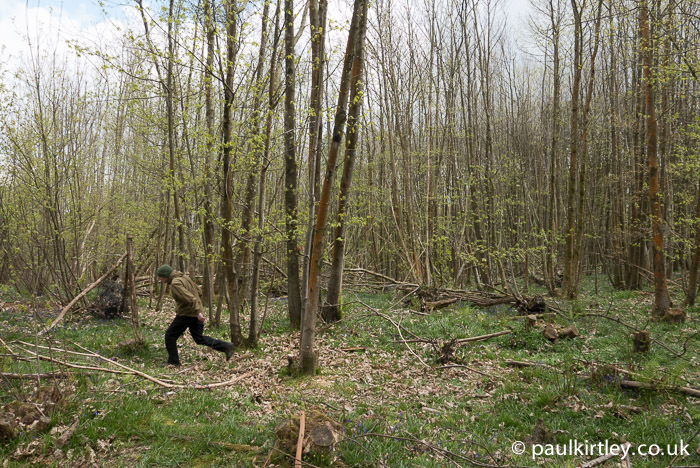 So we usually took the small ones, that’s more like steeling an Apple, if not helping to hold the forest clean. Do you think that if i can choose, it is worth to fell and saw a larger tree in parts, and hack it, instead of collecting a few small ones? In whet konditions they are whet in the outer Parts too, like you should have it in Britain. But it is far less of work to proceed the smaller trees. And they are drying at the fire. Ok, it may be a kind of fun. But if i am lazy? Is it worth the work? I only use open fire in the forest. 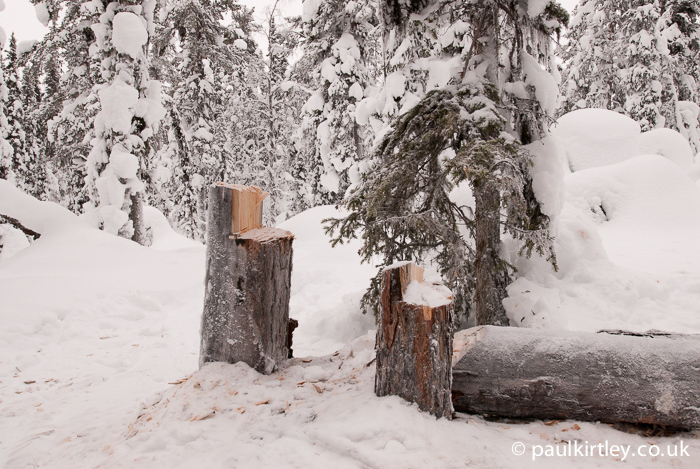 Here we use Sami Lavvus, or lean to constructions, no tents with stoves. 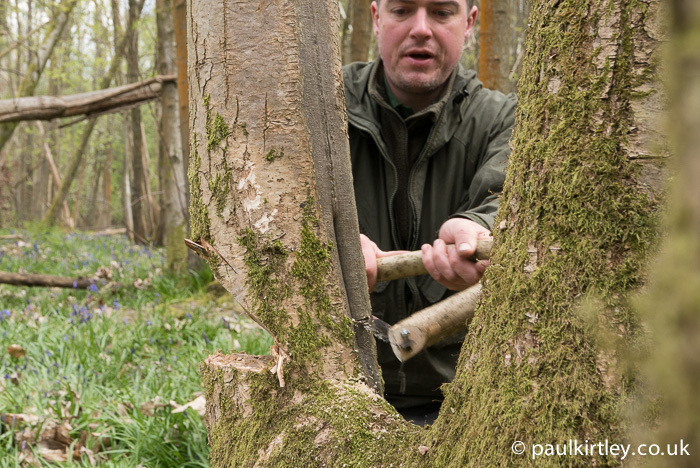 Great reference material but I can’t recommend Paul’s woodcrafter course enough if you want real confidence in these areas. You can’t beat hands on experience especially under expert tuition.